Tradition and national partiality have carried up the institution of "the Thistle" to fabulous times, but, leaving conjecture and surmise for fact and reality, we cannot trace the Order as an organized Knightly fraternity, further back than the reign of King James II. of England and VII. of Scotland. 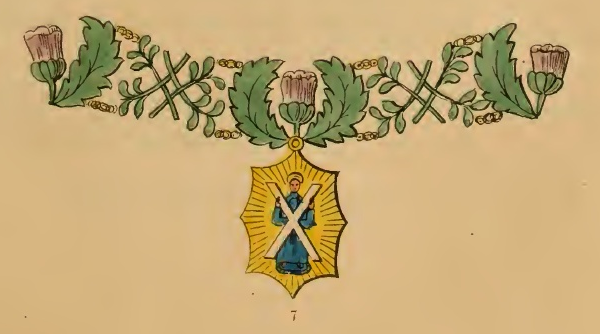 Nevertheless, in the Royal Warrant issued by that monarch before the promulgation of the Statutes, reference is made to the fact, that "his Majesty's Royal predecessor, Achaius, King of Scots, did institute the most ancient and most noble Order of the Thistle, under the protection of St. Andrew, Patron of Scotland, in commemoration of a signal Victory obtained by the said A chains over Athelstan, King of the Saxons, after a bloody battle, in the time of which there appeared in the heavens a White Cross in the form of that upon which the Apostle Saint Andrew suffered martyrdom". King James II. 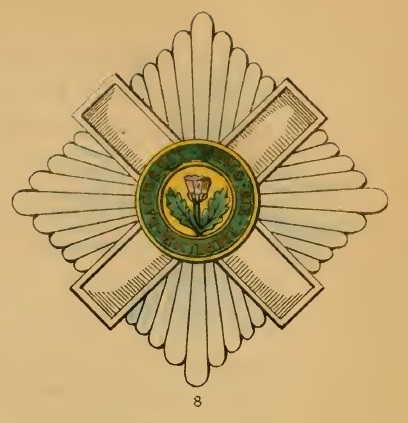 may, under any circumstances, be considered the fountain-head from which is derived the present organization of the Order ; true it is, that after his abdication, this Knightly institution fell into desuetude, and so remained until the year 1703, when Queen Anne directed Letters Patent to be passed under the Great Seal of Scotland to revive the Order : the statutes, then authorized by her Majesty, were very similar to those of King James, and are those which are still followed. 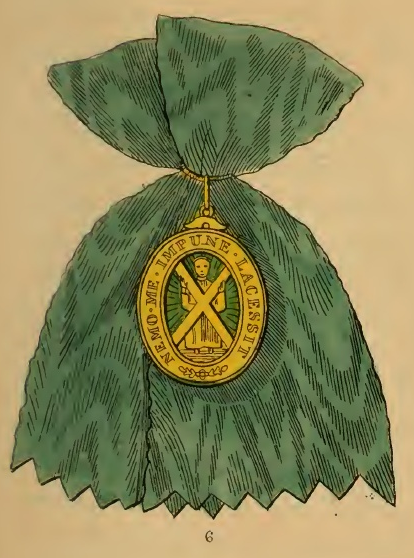 The Star of this Order, which is worn on the left side of the coat or cloak, consists of a St. Andrew's Cross, of silver embroidery, with rays emanating from between the points of the cross, in the centre of which is a Thistle of green, heighttened with gold, upon a field of gold, surrounded by a circle of green bearing the motto of the Order in golden characters. The Badge or Jewel is worn pendent to the collar, or to a dark green ribbon over the left shoulder, and tied under the arm. It consists of a figure of St. Andrew, of gold enamelled, with his gown green, and the surcoat purple, bearing before him the Cross, enamelled white, the whole surrounded by rays of gold in the form of a glory; the cross and feet resting upon the ground, of enamelled green. The Collar is of Thistles, intermingled with sprigs of rue. By a Statute passed in May, 1827, the Order is to consist of the Sovereign and sixteen Knights. Motto - Nemo me impune lacessit. 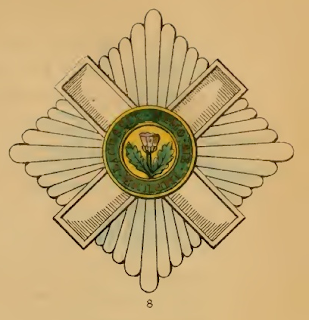 The Officers of the Order are : The Dean, the Secretary, the Lord Lyon King of Arms and the Gentleman Usher of the Green Rod.